When choosing bridal accessories, it is important to make sure that they coordinate with your entire bridal look. Bridal jewelry is one of the most exciting things to pick out for an upcoming wedding. The right jewelry will compliment your ensemble, instead of being a major focal point. That being said, many photos will be taken of your jewelry, often close-up. Coordinating jewelry with your bouquet is a great way to make sure that you look pulled-together in each photo. Color is an important factor when coordinating jewelry with flowers. Before choosing your bridal jewelry, know what flowers you will be carrying and what colors they will be. This way, you can make sure that your jewelry will not clash. Most crystal or diamond jewelry looks great with any color of flower, and is a safe bet. If you would like a little more color from your bridal jewelry, consider harmonizing the colors rather than matching them. For example, if you are carrying a bouquet of yellow flowers, choosing a yellow gold bracelet will pick up the yellow from the flowers without matching exactly. In modern times, having too many matching items or colors together can appear a bit old-fashioned. The style of bouquet is also worth considering. A traditional, rose bouquet will look best with classic jewelry, such as pearls, while a modern grouping of flowers may look out-of-place with the same pearl jewelry. If you are wearing heirloom jewelry, it may be best to stick to a traditional bouquet style for the most cohesive look. In addition to considering bouquet color and style, it is also important to make sure that you don’t overdo it. If you are carrying a huge, over-the-top bouquet, skip any bracelets and keep the rest of your accessories fairly simple. If you have a plain bouquet and gown, you can have a little more fun with accessories. The key is to look polished and balanced. On your wedding day, you should be the center of attention. 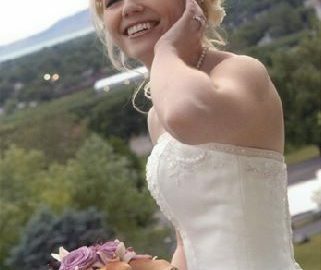 Piling on jewelry with a large bouquet can not only overwhelm you visually, but can also be the source of regret when looking at wedding photos in the future. In 2012, statement jewelry has been a big trend, but that may not be the case in a year or two. Keeping color, style, and balance in mind will help you plan a flattering and appropriate bridal look. Coordinating your bouquet, jewelry, dress, and other accessories will help you look your best in all of your wedding photos and on your big day. By: Anna Knight is lead contributor to www.SimplyBridal.com. She was born and raised in New York. She loves fashion, especially jewelry and shoes. She adores simple, classic pieces and even designed her own wedding dress. She tied the knot in 2010 in a small, intimate ceremony, but can’t wait to renew her vows in Bali.